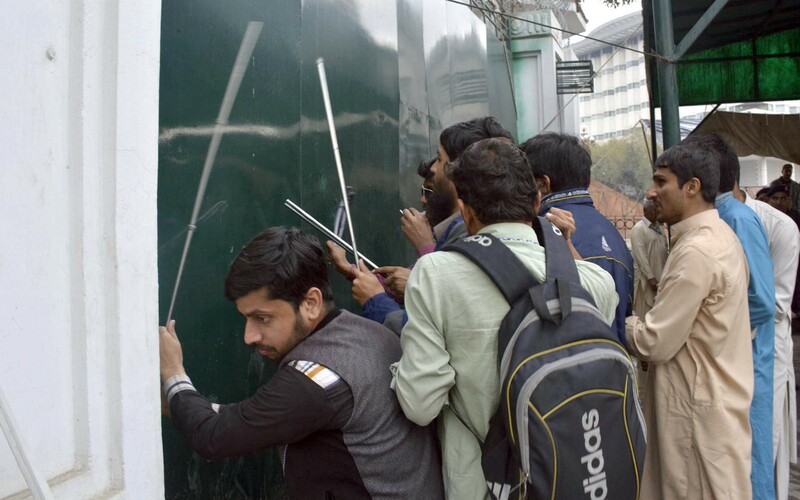 LAHORE: A group of at least 10 visually impaired men on Saturday allegedly punctured vehicles, broke their glasses, and snatched keys of about three to five vehicles while protesting to grab the attention of the parliamentarians who had come to cast their votes for the Senate elections in Punjab Assembly. The sticks-wielding visually impaired men reportedly thrashed a number of drivers and guards of the ruling class. 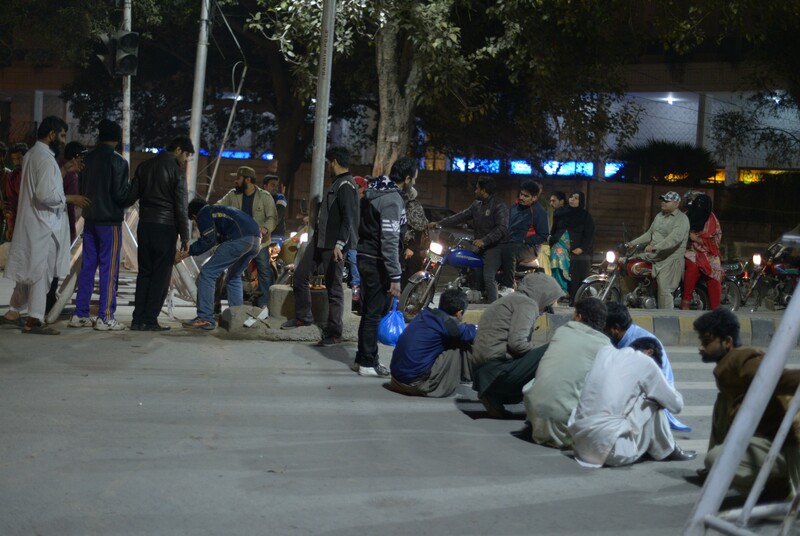 They also blocked the main entrance of the assembly on the Mall Road and raised slogans while demanding jobs from the Punjab chief minister. According to the secretary to Pakistan Muslim League-Quaid (PML-Q) president, Sufi Anwar, the blind also snatched the keys of a vehicle (LET-3400) from driver Ghulam Qadir and later demanded Rs10,000 in return of the keys. “The blind came and thrashed our stationary vehicle. They snatched the keys, broke the glasses and mirrors. Why should we pay them Rs10,000?,” asked Sufi while looking perturbed. “The media personnel should switch off their cameras and allow the police to get the keys back from them,” he said. Sufi alleged that the driver and guards of the Pakistan Tehreek-e-Insaf (PTI) central Punjab President Aleem Khan had misbehaved with the protesters when they attacked Aleem’s vehicle and they were now avenging it. 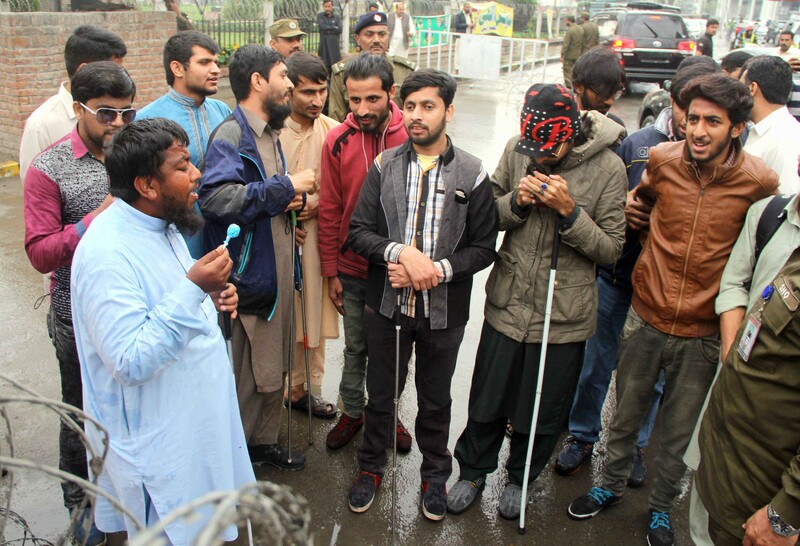 Group leader of the visually impaired, Muhammad Fiaz said that no one snatched any keys or damaged any vehicles. “We partially damaged the vehicles whose drivers tried to run over us during our protest. Every action has a reaction,” he added. He also denied the alleged demanding of Rs10,000 for the return of any vehicles’ keys. “When the drivers of the vehicles misbehaved with us, our fellow Ehsan Khan’s mobile phone got lost. We demanded Rs10,000 for the loss of our fellow’s phone,” he said. Fiaz claimed that neither did the police officials nor the security staff of the Punjab Assembly react to the protest that lasted for almost six hours. Visually impaired Zeeshan Ahmed said the government appointed about 200 blind people on daily wages and on work charge basis. The rest of the 200 blind people were not given any jobs. “We demand from the government to provide us with permanent jobs so that we too can live with respect and dignity,” he said.